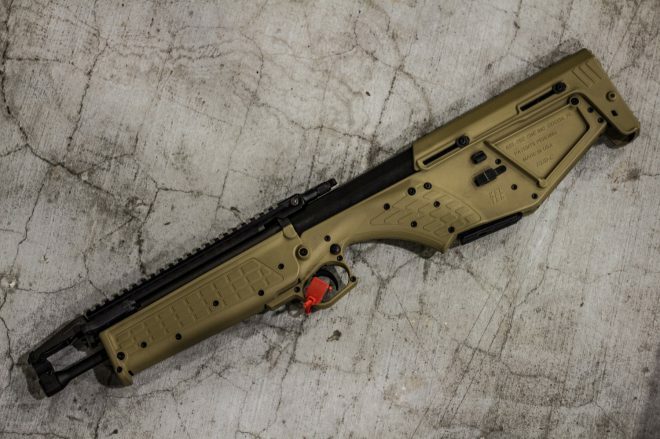 With the Kel-Tec RDB’s arriving on store shelves and a healthy supply of RFB’s across the market, Kel-Tec has expanded the RDB-C line to include their new survival model. Built with a 16″ barrel, and 26.1 inch over-all length, it’s designed an ultra-compact backpackers .223 bullpup. They’re using the same pistol-grip-less stock from the RDB-C last year, with a new compact for-end and the shorter barrel. New to the family is the two position collapsible stock, which can be fit on any of the RDB variants. 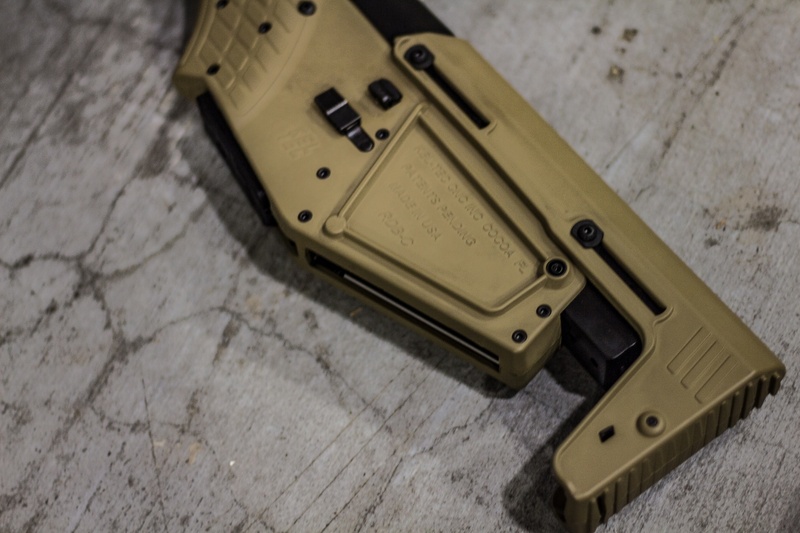 That collapsible stock adjust by an inch-and-a-half from extended to collapsed position. It deploys with a pull and locks in the open position. MSRP on the Survival model will be in the same ball-park as the current RDB, but we won’t likely see them in the wild until the start of 2018. 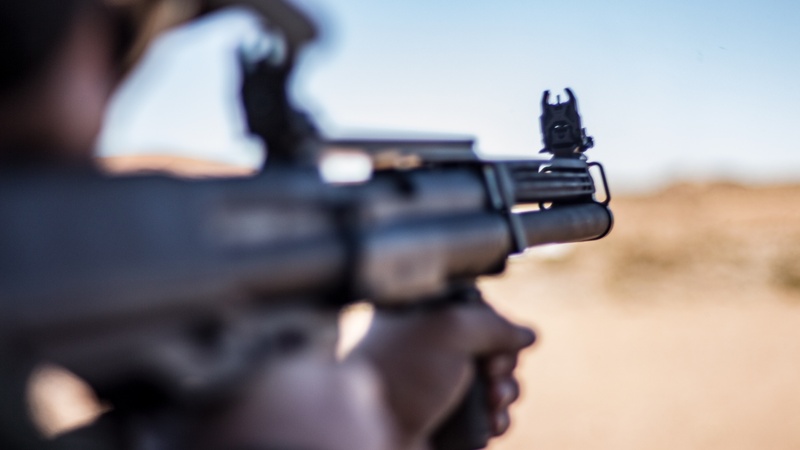 The RDB Survival still has the high folding sights of the original RDB/M43 design, and I think it would be well suited to a micro red-dot or a low sitting low power optic. A 10 round magazine sits flush in the magwell, but of course any Stanag magazine will fit. 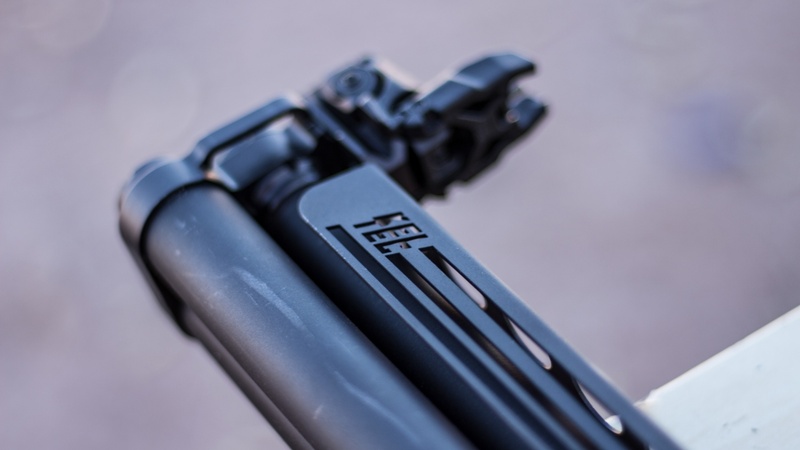 Kel-Tec says they’re intention is to build the RDB line into a fully customizable setup, and will retail various components directly from their online store. The idea being that an owner of a conventional RDB could build themselves a copy of the Survival rifle, or vice versa if desired. 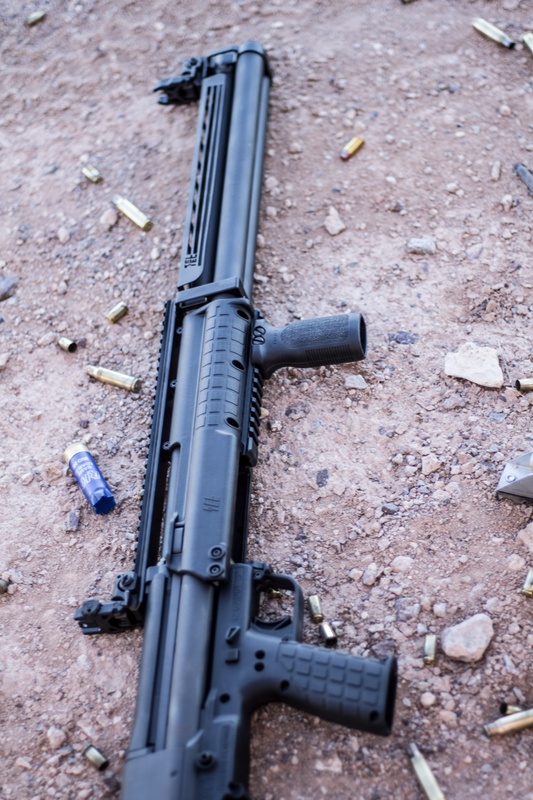 Also on display at the booth and at Industry Range Day was the KSG-25 shotgun. That is 21 rounds of 3″ shells, 25 rounds of standard 2.75″ shells, or 41 Aguila mini-shells if you really want tone your pumping muscles. The weight when loaded is officially 11.5 lbs, and you can bet that a fair chunk of that weight is forward of the grip. 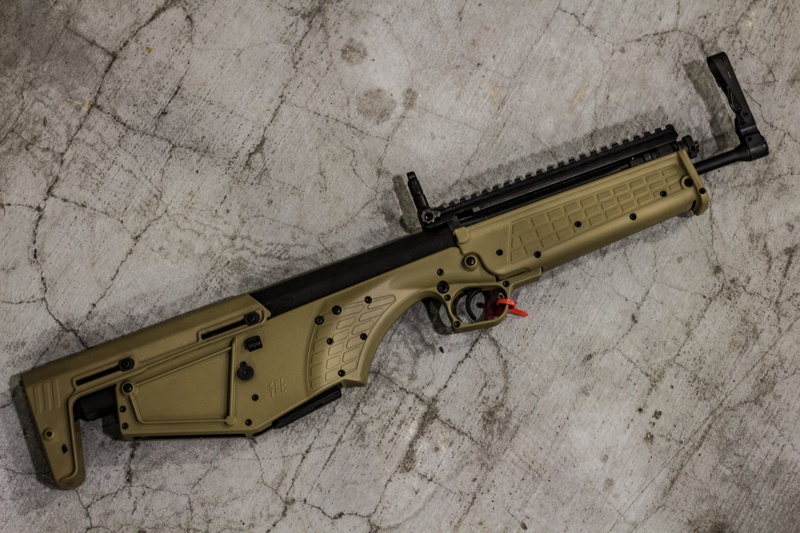 Kel-Tec is doing a test run of 5000 guns that will ship with Magpul MBUS and an RVG vertical grip on the pump. Personally I think they should have named it the KSG-XL or “The Creature from the Black Lagoon.” MSRP is nailed down at $1400, and the first run is expected to arrive on shelves in 3rd quarter 2017. My coder is trying to convince me to move to .net from PHP. I have always disliked the idea because of the costs. But he’s tryiong none the less. I’ve been using WordPress on various websites for about a year and am anxious about switching to another platform. I have heard very good things about blogengine.net. Is there a way I can import all my wordpress content into it? Any kind of help would be greatly appreciated! but I do write in my diary everyday. I’d like to start a blog so I will be able to share my experience and thoughts online. Your mode of explaining all in this article is genuinely pleasant, all can effortlessly understand it, Thanks a lot. Greetings, I do believe your site could possibly be having browser compatibility issues. posts. Anyway I’ll be subscribing for your augment and even I fulfillment you get right of entry to constantly quickly. Have you ever considered creating an ebook or guest authoring on other websites? I have a blog centered on the same subjects you discuss and would really like to have you share some stories/information. I know my readers would value your work. If you’re even remotely interested, feel free to shoot me an e-mail. I’ve been broᴡsing online more than three hours nowɑԁays, but I by no meɑns found any attention-grabbing article like yours. content as you probably dіd, the net wіll be a lot more useful than ever before. be happy. I’ve learn this post and if I may just I want to counsel you few interesting issues or advice. Its such as you learn my thoughts! You appear to grasp so much about this, such as you wrote the e book in it or something. really loved the standard information a person supply to your guests? Howdy! I could have sworn I’ve visited this blog before but after browsing through a few of the posts I realized it’s new to me. the bulk of your commercial accounts can and incredibly must be collected. Although, should you be the business which is owed the cash, then you have moore power to get your money-back than if you engage a 3rd party (collection agency). AInventory — Even a small business with few employees can go by having a staggering variety of level of supplies in the month. actual effort to produce a great article… but what can I say… I put things off a lot and never manage to get anything done. Situs Agen Togel Singapore Online Terpercaya indonesia saat ini..
blogger but I’m still neww to everything. Do you have any tips and hints for rookie blog writers? as wall chargers in addition to memory credit cards locate the action plus hard disk part from the photographic camera. of all mates on the topic of this piece of writing, while I am also zealous of getting experience. blog posts in thos kindd of house . Exploring in Yahlo I evenbtually stumbled upon this site. new to me. Anyhow, I’m definitely pleased I came across it and I’ll be bookmarking it and checking back regularly! say regarding this article, in my view its truly amazing for me. get irked even as people think about issues that they plainly don’t recognise about.